Looking for a quick and easy solution of getting rid of your waste materials? Call Putnam Construction Services and enquire about our grab hire service for both commercial and residential customers. We turn up, collect all of your waste materials including soil, brick, clay and rubble and drive away, it´s as simple as that! And don´t worry if your waste is in difficult to reach areas, we have modern machinery with attached hydraulic arms to make our job easier. All of your waste materials will then be disposed of in an environmentally friendly way and as much of the waste will be recycled as possible because we take our environmental responsibilities seriously. 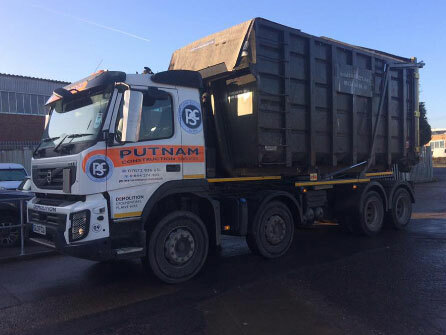 Our modern lorries can carry up to 16 tonnes which is the equivalent of 2 large skips so one visit may just be enough to clear away waste from your home or garden, commercial site or to clear up your demolition area. Call us today on 0800 999 8700, let go of your waste disposal worries, let the professionals deal with it!